Recently I celebrated my birthday, I'm not a huge fan of making a fuss. A hot stone pedicure and a manicure certainly wasn't a bad start my day after some morning exercise. Finding a new dress to wear to lunch was the bonus! The brand is The Cherry Shop and the dress cost $69.00, an easy wash and wear option. This is a very relaxed look, perfect for a lunch out with friends or a BBQ. 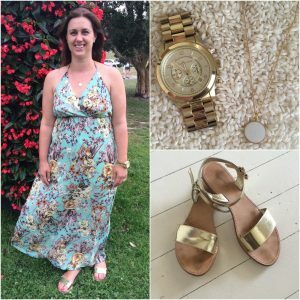 I wore it with gold Sambag sandals that I purchased from a recent warehouse sale, a Michael Kors over sized gold watch and a delicate Kate Spade gold chain. The denim jacket (Sussan $99.95) is easy to throw on if the weather suddenly changes.